Seeking to include cultural representation within your organization as a way of representing the population you are mandated to serve is the base-level expectation in today’s climate. A goal of this writing is to support organizations in changing their structure towards understanding and respecting the effort needed in establishing a welcome environment including the spaces where staff, board, volunteers and the public engage. Whenever conversations begin regarding the role of culture in relation to another identified group, not sharing cultural backgrounds, motives are the first thing many people think about. Why are groups attempting to communicate with each other? Is this a response to societal pressures or are there legitimate reasons for this interest in my culture or group? How do they benefit from my involvement? Sadly this automatic response to many situations is a barrier that we all must find ways of overcoming as it creates further division between groups that will benefit from working with each other. The arguments and situations I am exploring in this writing deal with the limited capacity of one specific group being represented by a person or party working towards engaging another specific group being represented by a person or party. I understand that this is almost impossible, as many people represent a volume of identities and cultural backgrounds with their presence. This simplification of relationships is made to attempt to reach the core of issues and discover actions. These are then applied to various roles and backgrounds where parties find relevance. It is also worth stating that no individual can ever speak on behalf of any group of people based solely on their birth or choice, each member of that group would have to explicitly agree to this representation in order for that person to be their voice. Our closest public example would be elected officials and many cultural representatives are not elected by anyone. I would also like to state that “diversity” and “multiculturalism” are not terms I am comfortable applying to anyone, ever as they group people into categories with or without their consent and typically represent the perceived perpetuation of systemic issues of racism that have been within systems of power for a long time. Translation: these terms have lost their original intent and now are misused too often as “lip service” without action. This leads me to thinking about how our recent history of political correctness could almost be mapped out showing progress in the changes of common use for language regarding these terms. I said almost. Currently, Cultural Pluralism is a healthy way of discussing how all people hold individual representation along side of “all”. We could use the term “equality” but Cultural Pluralism forces people to understand that we are talking about specific issues in relation to “all”. There is no t-shirt that says “NO LIVES MATTER”. This is why the “All Lives Matter” comments made in attempts of creating conversations around universalism are pretty offensive and have little value. What does an organization need to do to prepare for to engage many peoples in an attempt towards higher levels of cultural pluralism through representation? When cultural groups look at working together; it is imperative that both parties understand and anticipate that individuals from marginalized communities may feel isolated and/or challenged by their peers when they engage with perceived “powerful” organizations. It is a common issue that the presence of someone representing a marginalized role in relation to a larger power structure is tokenizing themselves and their peers can be vicious in the defensive of the shared social justice cause. Many of us consider these causes to be a matter of life and death as human rights are at the core of these issues. Do not take social justice / cultural issues lightly. This means that any micro-aggressions, stereotyping or unreasonable expectations that may exist within your organization or group must be addressed completely before the first conversation begins. Safe spaces are required in order for people to feel brave enough to contribute in any capacity. Brave spaces exist where all can feel welcome to speak openly. You want to create shared space so that both groups feel safe, brave and welcome. If you notice a commonality to these people it is because class, race, identity or gender do not enter into the modes of division but instead these categories look at relationships to the land itself. This is not intended to be a methodology to base your decisions upon but instead as a way of showing alternative modes of viewing people and cultures to understand that none of us have a one-size-fits-all solution, just different attempts at making higher levels of understanding. There are challenges associated with the task of educating people about communities including acting as educators and advocates in regards to basic human rights that many take for granted. There is a difference between asking a questions and asking for advice. There is a difference between sitting with someone of a specific background and having them representing that background formally. With this in mind, where does formal education or cultural awareness begin? The starting point for bringing someone down a path of awareness begins with an understanding of your own position in relation to the issue you are addressing followed by being clear in your communications; not confrontational. Volunteering information about how any person or organization can self-educate is always a valuable way of establishing a starting point to a relationship. Ask questions and take time to be as tolerant as you feel comfortable. Think of your own self-care and ensure that you are not working too hard to conform to helping others, make sure they are working to help themselves. Always think of yourself in relation to the entire planet. Think of the following chart as a very slow way to move a new relationship towards a long-lasting one. Ask yourself where some of your existing relationships stand on the following chart. Sounds like a ton of work right? How can anyone ever have this level of relationship status with all the people within your organization? Possible, but it is highly unlikely. Without this commitment organizations must rely on people playing the role of cultural educators, often as the only role they play within the organization. Many large groups are developing cultural-specific projects or even cultural departments within their institution. This requires participation from the stated culture within the governance, development, management and implementation of the stated actions forcing cultural-specific board members to be sought after as they are viewed as a commodity. Although I view this behaviour to be a current step towards higher levels of successful cohabitation between communities, it is still being done often from the standpoint of one group and not with the well being of both communities in mind. How can this change or adapt to ensure respect is achieved when time and effort cannot? A Lawyer is a person who practices law, as a paralegal, advocate, barrister, attorney, counselor or solicitor or chartered legal executive. Working as a lawyer involves the practical application of abstract legal theories and knowledge to solve specific individualized problems, or to advance the interests of those who hire lawyers to perform legal services. Receiving an undergraduate degree to then become a lawyer is typically completed in four years of full-time studies. In order to qualify to be accepted into law school, most law schools in Canada require the completion of at least three years of your degree or a completed degree. Mediation law refers to a form of Alternative Dispute Resolution (ADR) in which the parties to a lawsuit meet with a neutral third-party in an effort to settle a case. This third-party representative is called a “mediator” with publicly listed rates varying from $150 USD per hour to $700 USD per hour based on the amount of people being represented. In the case of large-scale businesses or corporations it becomes a estimated amount and a set contract instead of an hourly rate as the volume of people being represented is too high for hourly rates to apply. This is how corporate mediators reach millions in the negotiation of assets between large incorporated entities. The reasoning behind exploring the role of lawyers in mediation is to show the value placed on understanding law, laws that anyone can read in a book or through various online sources. Cultural knowledge can, to a degree, be learned in a similar way and would take at minimum the same amount of time. The difference is that many cultural viewpoints (or all) are ones that cannot be learned but instead have to be lived experiences in for the speaker to truly understand. This means that it takes longer to learn cultural knowledge and you may not have gone to school to gain the knowledge. A person from a war-torn country can speak to what that feels like more than any reporter can express. A person recognizably of colour feels racism more than anyone can know through the gaze of a pale-skin public. A man of large physical stature cannot be fully aware of how imposing they are merely through their proximity to women, one-third their size. Know one can truly understand the emotional state of another persons inherited or lived experiences; we can only be sympathetic, understanding and responsive to their needs. A Cultural Mediator is someone who employs their background, both lived and inherited, towards ensuring people working together are sympathetic, understanding and responsive to the needs of all parties. They ensure a standard of cultural sensitivity and create safe spaces. They only speak with their own voice and do not attempt to represent more, instead utilizing their position to ensure all sides further relationships and work towards mutually beneficial goals. 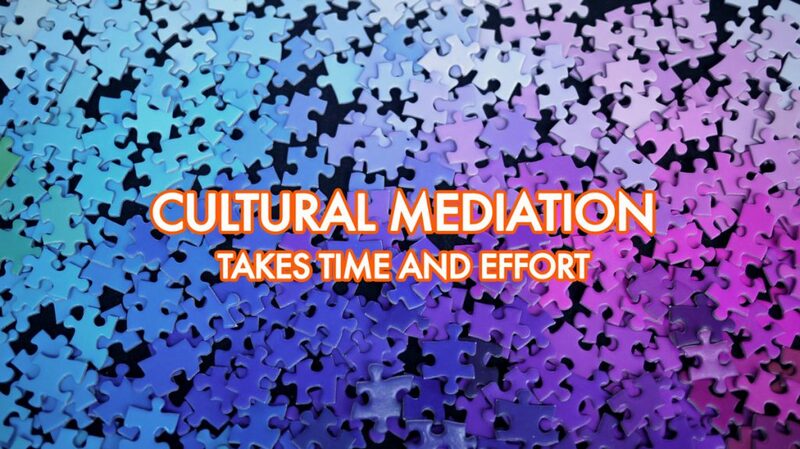 Cultural Mediators exist within many institutions but not everyone understands the value of their role. Representatives within the some cultural organizations charge approximately $750 per hour for cultural teachings / cultural sensitivity training for groups up to 12 people. An example would be that Clayton Windatt charges $300 per hour for venture guidance and cultural sensitivity awareness on major corporate projects when working as a consultant. Clayton most often begins his introduction by saying “I am only working on this project because you really f**ked this up…”. It always costs more for people to repair relationships than to start relationships off with honest effort and hard work. Honest effort and hard work can only be replaced by large amounts of money. Many organizations have Cultural Mediators on their boards or within their staff with expectations for them to ensure a standard of cultural sensitivity is in place or presuming that their individual cultural background allows the institution they work for to engage in cultural actions. If representatives are playing cultural roles within any organization then they are already Cultural Mediators with or without the intention of providing this relatively large role in relationship dynamics. The question is; how are you treating them? If you had to pay $300 per hour to casually ask them relatively insignificant, yet culturally relevant questions, would you do it in an off-hand manner? Do you ask your other board members the same questions or do you focus on those that identify? Do all your board members bring the same weight to the table or are those in Cultural Mediator roles being asked to do extra? These are realistic considerations that need to start taking place within many institutions as the expectations for various Cultural Mediators are to play an extra role above and beyond their title without consideration of the power dynamics this creates. Expecting people with inherited or lived experiences including cultural backgrounds to contribute as Cultural Mediators above and beyond the roles established for the group perpetuates the systemic issues of unbalanced power dynamics. How can organizations establish healthy relationships with existing or new Cultural Mediators?